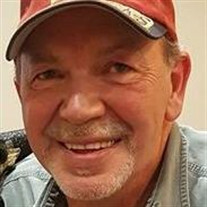 James Gregory Burress, 59, passed away Wednesday, January 3rd, 2018. He was born December 31st, 1958. He was a member of the Floral Baptist Church. He enjoyed deer hunting and the time he spent with his grandchildren. He was preceded in death by his father, Buddy Burress; and his brother, Lance Burress. He is survived by his mother, Annette Burress; his son, Keith Burress and his wife Leisa; two sisters, Debbie Jones and Jackie Smith; and three grandchildren, Eden Burress, Hayden Burress, and Mason Spiker; and a host of extended relatives and friends. A memorial service is scheduled for Tuesday, January 9th from 5:30 PM - 7:00 PM at the Floral Baptist Church.